Like those, it manages state changes through its virtual dom aiming to make the code more maintainable and performant. It focuses on developer happiness, high-quality tooling, and simple, repeatable patterns. Having said that, friction can still be a good thing sometimes. In game design, for example, friction is actually required. dreamt up January 9, 2018 by webguru	in Uncategorized | Comments Off on Visual Studio Code Can Do That? About two years ago, I begrudgingly opened Visual Studio Code (VS Code) for the first time. The only reason I even did so is that I was working on a TypeScript project (also quite begrudgingly) and I was tired of fighting with the editor and the compiler and all of the settings that I needed to make a TypeScript project work. Someone mentioned to me that TypeScript “just works” in VS Code and I was pleasantly surprised to find that they were right. Source: Smashing Magazine, Visual Studio Code Can Do That? wpDataTables is a best-selling WordPress plugin that can help you generate tables and charts in WordPress with a few simple clicks. Some fantastic graphs that show roadmaps for becoming a web developer in 2018. By Kamran Ahmed. David Gilbertson captivates us with his charming sarcasm in this fictional, yet alerting scenario. Rachel Andrew updated the existing Flexbox guides on MDN to reflect the core use cases. In this article, Ire Aderinokun summarizes what additions and removals there have been to the new HTML spec. The most hearted demos on CodePen of 2017. Learn about the new, up-and-coming standards for Web Payments in this article by Peter O’Shaughnessy. Dotgrid is a vector tool that works by adding control points and connecting them with different line-types. Read more about it here. An article on the recently disclosed security vulnerabilities and measures to take as a web developer. Some great insights for better performance from the experts in the field. A fun demo of pixel fireworks by Jon Kantner. The mother of all checklists. Curated by Yingjie Hu. The first part in a series that sheds light on the state of JS frameworks. An interesting CSS only solution to a peculiar problem. By Roman Komarov. A great set of 40 UI icons in all major formats. Free for a subscription. In case you missed it: Docusaurus is a project for easily building, deploying, and maintaining open source project websites. Roman Liutikov explores recursive data structures and how they work together with lazy evaluation. A refreshing sans serif including Cyrillic characters designed by Igor Kosinsky. A Python library for making Electron-like offline HTML/JS GUI apps. By Chris Knott. View Mybridge’s top 30 picks from nearly 8,800 open source Machine Learning projects. A very creative monospace typeface designed by Damiano Cenderelli. 8 iPhone X mockups for Sketch and Adobe Photoshop with super high resolution. A free numeral typeface with beautiful number designs made by Katie Wasserman. Collective #380 was written by Pedro Botelho and published on Codrops. dreamt up January 8, 2018 by webguru	in Uncategorized | Comments Off on Ghost Button Design: Is This Really Still A Thing (And Why)? For such a small design element, buttons sure are a complicated one to tackle. It makes sense, what with call-to-action buttons serving as the next step in your visitors’ path to conversion. Mess that up and you might as well say “bye-bye” to business. Though we have a good understanding of the types of button design rules that universally work, there will be times when you’re surprised by a rogue element that performs well. Source: Smashing Magazine, Ghost Button Design: Is This Really Still A Thing (And Why)? 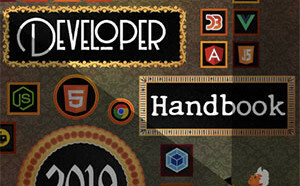 Current and aspiring web professionals must continually grow in order to stay relevant. Our field doesn’t allow for stagnation. In part one of this series, I discussed the importance of project retrospectives in facilitating and documenting team growth. We don’t always have the luxury of engaging in team retrospectives, or even of working on teams. Personal reflection provides similar benefits, while focusing on your individual experiences. Personal reflection enables us to process and make meaning of all of the great (and not so great) learning and working experiences we’ve had. An old schoolish, yet refreshingly realistic design with a brilliant navigation. Our pick this week. Embed HelloSign API into your app in minutes, with only a few lines of code. Explore Julien Espagnon’s journey of learning to code with experiments he made each day in 2017. Sara Soueidan explains how to auto-size columns in a CSS grid layout in this great article. A tiny CSS framework that aims to preserve everything Skeleton, Milligram, and other micro frameworks have to offer. By Arham Jain. A very useful front-end performance checklist for 2018 by Vitaly Friedman. Eric Elliott’s fantastic analysis and predictions for 2018. An interesting demo employing CSS Grid, Flexbox and position: sticky. Made by Josh Collinsworth. An interesting three.js experiment by Yoichi Kobayashi. Sara Soueidan shares an SVG snippet that replaces a CSS object-fit declaration. Read about Sapper, a new web app framework by Svelte. Read Chen Hui Jing’s inspiring article on building a ‘webic’ community in Singapore. Headless-devtools lets you perform Chrome DevTools actions from your code by leveraging Headless Chrome with Puppeteer. Can Preload Cut the Mustard? Scott Jehl writes on a an interesting peculiarity of link[rel=preload]. A tool for collecting design feedback quickly and easily. Free for the first couple of months. Anna Grenn shows how to create the perfect gradient inspired by nature. A list of the most notable events in front-end engineering in 2017. Complete set of Instagram filters in pure CSS inspired by CSSgram. John Moore Williams explores the hottest web design trends, techniques, and tools for 2018. Collective #379 was written by Pedro Botelho and published on Codrops. It’s 2018 already, and countless front-end developers are still leading a battle against complexity and immobility. Month after month, they’ve searched for the holy grail: a bug-free application architecture that will help them deliver quickly and with high quality. I am one of those developers, and I’ve found something interesting that might help. We have taken a good step forward with tools such as React and Redux. However, they’re not enough on their own in large-scale applications.